Tony Hunter (Fred Astaire), a fading movie star famous for his dancing, is cast in a play written by two of his remaining fans. 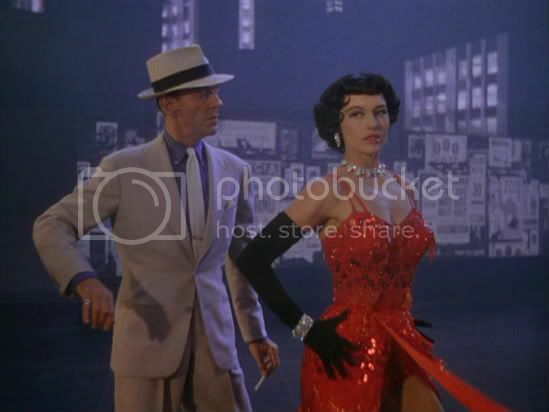 This pair then convince an outrageous Broadway director, Jeffrey Cordova (Jack Buchanan), to direct their work, and he, in turn, hires Gabrielle Gerard (Cyd Charisse), a famous ballerina, to play the female lead. Unfortunately, the production quickly runs into a number of problems. Not only do Tony and Gabrielle immediately take a disliking to one another, but Cordova also significantly reworks the play in which they will be starring. 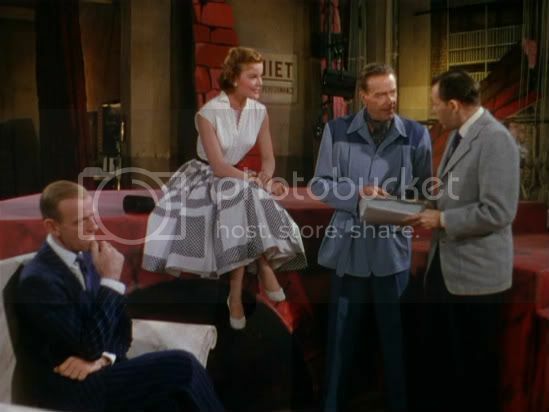 Although there is little in Vincente Minnelli's musical The Band Wagon for which the film can be lauded, it is, nonetheless, likeable and consistently entertaining to watch. The story the director tells is largely forgettable and terribly predictable. Having introduced the characters to the viewer, and having shown him their personalities, Minnelli subsequently places various obstacles in their path to success. For instance, he allows misunderstandings between Tony and Gabrielle to stir up animosity between them. Of course, the moviegoer knows that, in the end, the two will overcome their difficulties and will begin to fall in love. He is also sure to realize both that the play which brings the characters together is sure to be a flop initially, because of Cordova's pretentious changes, and that, thanks to the heroes' resilience, its spirit is bound to be recaptured so that it will be a success in the end. As prosaic as all these threads are, Minnelli somehow invests them with enough humor and charm that the viewer never loses interest in the movie. The director's parody of artistic snobbery and Hollywood stardom are both appealing and funny, and his characters are, without exception, both amusing and likeable. What is more, The Band Wagon's ending, while certainly hopeful and happy, is not as neat as the moviegoer may expect it to be. The director, by refusing to tie up every strand of his narrative, leaves the viewer not with a sense of completeness, but with a sense of anxious expectancy that, somehow, is surprisingly satisfying. I should also note that the musical numbers are generally fun to watch, although none of them are really inspired. In fact, a few of the sequences which are performed as routines in the play around which the film revolves are somewhat disappointing. Most of these particular numbers are presented as though the director were showing clips of some longer routine and, consequently, seem incomplete. This approach, while inventive, sadly does not allow the viewer to immerse himself in the sequences so presented. What is more, a couple of these are just so adorable and saccharine that they are off-putting. 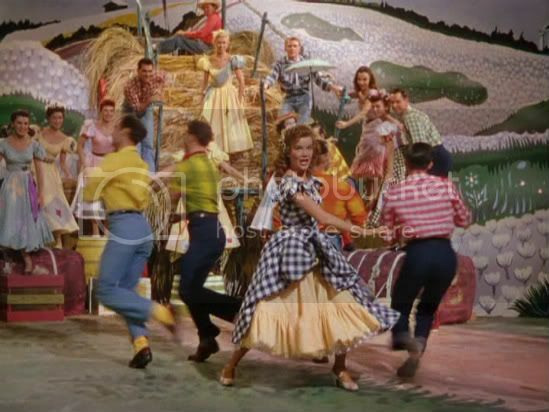 Despite such shortcomings, the movie does include a number of pleasant musical numbers. 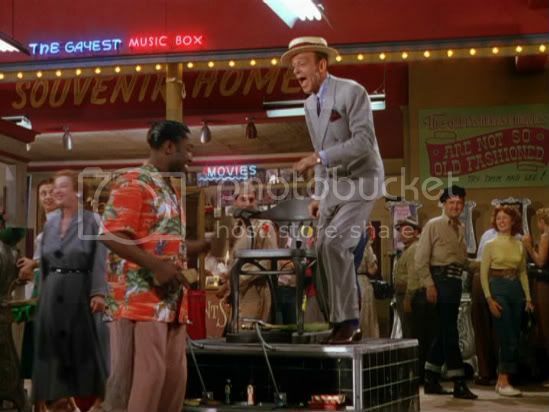 One routine, in which Astaire portrays a private detective, though part of the play, is shown as a whole and is sprightly, exciting, and entertaining. 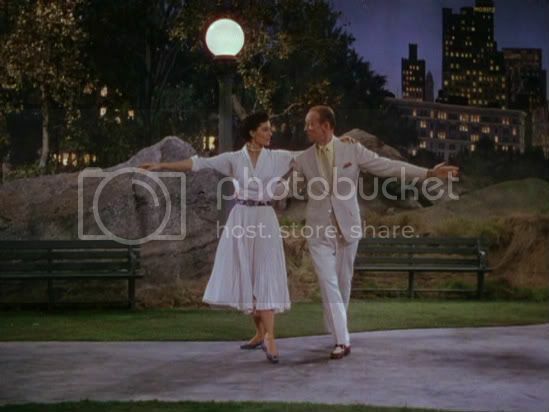 Another, in which Astaire dances with Charisse in Central Park, is genuinely lovely and graceful, and a third, depicting the former's playful antics in a penny arcade is vivacious and charming. Neither these nor any of the film's other numbers are brilliant, but some of them are sure to make the viewer smile. The Band Wagon is certainly not the best musical I have encountered, but it is well performed, often funny, and always enjoyable.